Cut the onion in half, then cut a thick slice of approximately 1 centimeter (0.4 inches). Separate the rings from the onion slice. Set aside. Place the flour in a dish, the milk in another dish, and the breadcrumbs in another dish. Add the salt and pepper to the flour or to the breadcrumbs, your choice. Dredge the onion rings, one by one, in the flour, then in the milk, and finally in the breadcrumbs. Heat up the oil in a pan and place the breaded onion rings in the pan. Allow them to soften a bit, crack the eggs, and place them inside of the rings. Cover the pan to cook the eggs and serve them on a plate when they are done. Top off the eggs with chopped cilantro or shredded cheese. This is a delicious breakfast idea. If you like eggs with onion, then these rings might just become one of your favorites. And you can make them in almost no time! Look for a relatively large onion, cut it into thick slices, and pull out the rings. Then, dip them in a flour, milk, and breadcrumb mix to make them as crunchy as you’d like. 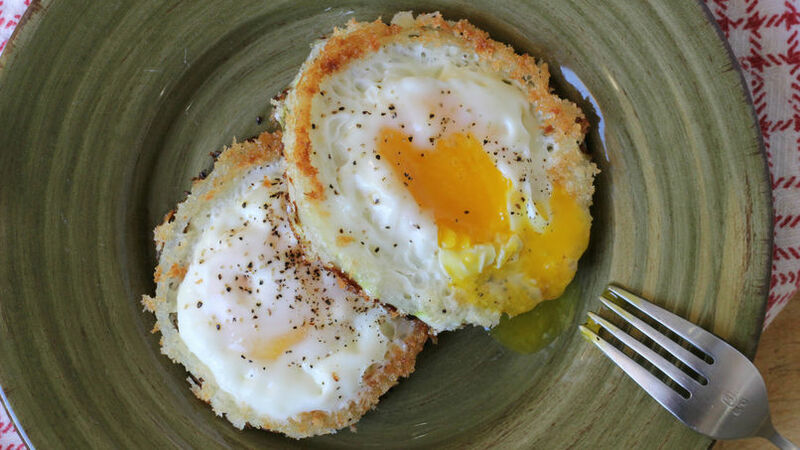 Add fried eggs to each of the rings and enjoy the deliciousness! It’s that simple. I’m sure you’ll love them!